Product will sell only when the features of the products are convincing enough, this will automatically sell the product. Let us study this with an example. See the below image. Which one would you prefer? See the intelligence used in the product marketing. 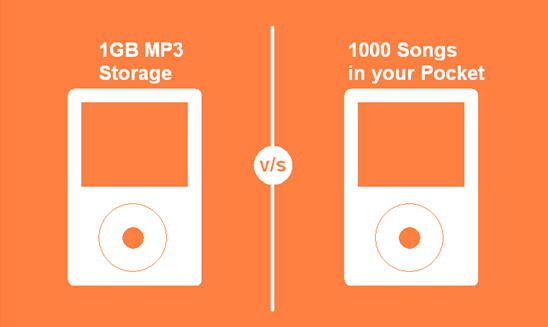 The buyers did not cared about storage capacity but were excited to carry 1000 songs with them where ever they go. This pitched the buyers and rest is the history. As discussed earlier brilliant call to action are a must for any website. It urges the visitor to take an immediate action either to buy, to call, to mail or to click. Many small B2B sites fail to deliver such an action and lose their part of sales. CTA’s are the vital vitamins for your sales and business at large they not only sell but also connects you with your buyer in different manner. Imagine you are searching about cars and end up on a computer spare parts website. How embarrassing would it be? This exactly happens with your buyers when your promise and fail to deliver. Visitor visits your landing page, email, newsletter etc. praising himself to have found a perfect solution and gets redirected to your site. When they come they get disappointed with what they see and click the back button. Remember, don’t promise what you cannot deliver it will create a negative image in buyers mind. 3 out of 5 purchases are transacted through mobile; that means mobile shopping contributes to 60% and you cannot afford to lose even a bit of that 60%. If your bigcommerce web design is not mobile optimized you can lose a heavy part of sales made on mobile devices. And not only sales but organic search performed through mobiles gadgets every second worldwide. Well, addressing these issues will definitely enrich user experience and site performance at large. But these are only some of the factors responsible. Concluding the 14 reasons that tempt visitor to run away from your website we hope that you might have grabbed the importance of each aspect of your website. 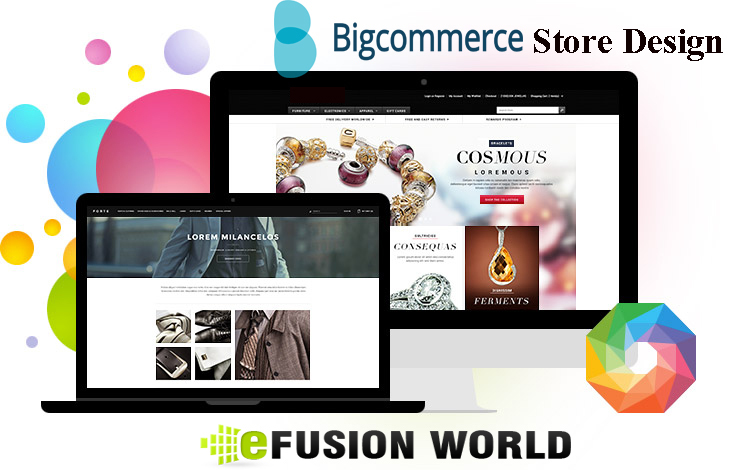 Contact efusionworld USA, for new bigcommerce web design or customized website as well as ecommerce solutions to get more sales, organic traffic and search rankings. When you ace the art of tempting buyers to buy from your store instead of others, when there are tough competitors selling the same products – YOU are a smart Seller. Ecommerce is flooded with sellers, vendors, buyers, products, SEO experts, marketing & designing professionals hardly leaving any stone unturned in any of the area mentioned above. Now, in this situation you need to be cleverer in attracting buyers to your store and make them buy. Is it possible? Off course, your web store design will speak to the buyer about your products, business, services standards and all those you offer to them. If you fail to make a good impression, your buyer will turn off immediately. Hence designs are razor sharp marketing tools that can influence buyers’ decision. Your professional approach towards your buyer & vendors determine whether you are a genuine seller or just an amateurish junkyard sale developer. Customer grievances regarding your products and services must be addresses quickly & rightly. If these complaints increase then your store ratings are certainly to go down. With increasing number of sellers online you need to be very careful with even a single negative reply. Draft a practical customer oriented service policy and stick to it. You will see results soon. Importances of simple Bigcommerce Web Design layouts were experienced when buyers got frustrated with complex designs. Remember, if buyers don’t find what they are searching for they will never resume to your store again. Complex yet user friendly designs are not a problem now a days, you have good designers to do the job. A beautiful design must be creatively build & intelligently coded to make your overall online presence meaningful. Do some online researches for designers, products, vendors, design companies etc. Keep following our blogs to get sales worthy tips & techniques that every online seller is practicing. You can also visit us to see what other services we offer.